Well in a way you may be right. We cannot blame them for everything, but on the other hand, this is not the NHL or MLB where you have salary cap and shared league revenues. They should have know better that buying Liverpool and supporting the english soccer culture is way bigger than their actual knowledge in soccer. Please do not get me wrong, Like all their moves especially Gillet, it was about making some money fast. They were not commited to the cause of the club. Look at Abrahamovich at Chelsea or Glazer at Manchester United, they bought invested and spent without asking to get the results and with results comes lots of dollars. In their case the first thing they did was to finance their debts with the clubs money. What does it leave for results. Not much!!! As far as Xavi Alonso, he was sold for big $$ to Real Madrid, the problem at the time of the sale, to replace him Benitez was left with Aquilani as the only viable option. Also, please remind when did really Benitez had control over market transfer ? it is only when he threatened that he will leave the club if he was imposed players he did not want and learnt that they had already met Klinsaman to replace him. It backfired on them when all the club fans went public against them. Gillet's track record speaks for itself. He bought the Montreal Canadians Hockey team for cheap, made out of the Bell Center a money making machine, where the average human being cannot even afford to go in and watch the most basic show. By the way, i live in montreal and to go watch the Habs with my son, if i had to buy semi-decent tickets (not front row seats), i am looking probably to spend 300$ not including 9$ beer and 5$ hotdogs or 5$ water bottle. This is the heritage Gillet left Montreal with. And he sold the whole thing this year with an almost 300 million dollars profit knowing he financed most of his deal with governemnt funds. Oh yes, what did he spend on the team? really nothing. they did not make the playoff half of the time and the other half they lost pretty early. So really he won nothing in Montreal either. this is the best possible news Liverpool FC can have as they really need an owner that will love the club first and foremost before his bank account because even with the bad year they are having, they have a sellout crowd of 43078 every home game. Liverpool lovers are among the most loyal fans on the planet and i am sorry to say it, but they DESERVE better than this. is there a point to this article? my view is they haven't helped and from what is out there in the news, have saddled us with more debt. and now they are selling out for what will obviously be a bit of a nice profit for them. how come i don't get business deals like this? Americans who buy British soccer clubs need to realize that it's NOT all about the money – it's about results and win/loss records. 99% of football fans could care less about how much money their team makes – for them it's ALL about results on the field, and silverware. That is why so many American owners have come unstuck, they simpy don't understand the game and its traditions, and they don't live and breathe the game like ordinary fans. If football in England is that successful and the fanchise so rewarding, why do they need billionaries in addition. It definitely is not fair to blame the American owners. They have invested loads of money into the club and the players and never, not even for a moment, had any piece of mind, thanks to their over expecting fans, average manager and below average players. I think its fair on their part to want to leave the club. Something that the unthoughtful supporters wanted for quite a while. Liverpool supporters want a Roman Abrohomovich kind of a owner who will shell many millions to buy big names. Unfortunately such owners are very rare, especially in the current economic climate. Bottom line: Out of Champs league, Out of Top 4. Owners selling club. Players wanting to leave club. Its totally their fault. They lacked the motivational driveto urge the team on in all the years they have been in charge. They threaten the teams balance by trying to hire Klinsman to replace benitez when they should have supported him. They openly showed that they were at logger heads at times when the team needed them most. The most important issue is the lack of capital injection to help compete with the likes of man u, chelsea and arsenal. Football now is big business, so if you manage it well, the higher the return on investment. We are tired of playing second fiddle to the other teams so please leave us and go back to your yankee. Fans will never know what exactly happened inside the club's board room. For example like Robby Kean's story, whose fault was it? Rafa said he never wanted him at the first place. But may be, if he kept him playing, we'd have had someone to rely on when Torres need a rest. Alonso's departure was Rafa's mistake, but we don't know who to blame when we cannot get Berry. (I don't think Berry was that good anyway.) But for Aquilani, it was obviously Rafa's lost gamble. The Italian cannot prove he's worth 20 million quid. And also several tactical errors in several games this season that caused us many points, that's Rafa's fault. So, I'd say Rafa should also to be blamed with the American owners, may be 50-50. Real madrid offloaded some quality players last season. Where was liverpool. We could have snapped up sneider and robben. Look at quaresma, the boy has talent but i wonder where the scouts are scouting. The problem is that Liverpool invests 15 million on a midfielder and the other teams will invest 30 million – and the pattern continues throughout the squad, Manchester United spends 46 million on Berbatov (a total flop) and Liverpool hoped to score with Robbie Keane for 10-15 million. That is the math. For 1st tier European stars you have to pay the big bucks. If you go for the players who are "just under" the excellent range, you end up with results which reflect your investment. One exception is Real Madrid- they've bought too many BIG players for too little positions and then you get BIG players on the bench, making them under motivated and the team is out of balance. If Liverpool wants success, they have to combine youth with superstars. Ajax and Arsenal have used this recipe for success in the past. Liverpool position on the table and in Europe is a reflection on their investments, and you can't blame the owners. They obviously don't want to be at the very top, they are satisfied with the sub-top. They are to blame. 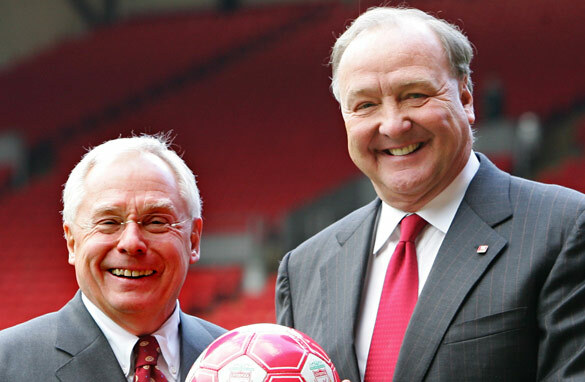 They saddled the club with massive debts while failing to deliver the stadium they'd promised. This season they undermined Benetiz's spending power because of the debt. The club needed more money to push on and not go backwards as all our major rivals – including all those teams now above us in the battle for 4th – spent more money than we did. We couldn't even afford a decent centreback to cover for all our injuries at the start of the season. Which had an effect on our poor start to the season. We also had no money to buy a decent back-up striker for Torres.